The property now occupied by the Hillsboro Club was initially acquired and developed as the winter campus of Lake Placid School, a private school for boys that was located in the Adirondacks. 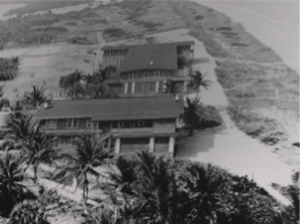 The Headmaster of the school, Herbert L. Malcolm, a 1907 Phi Betta Kappa graduate of Yale, had purchased 15 acres of choice land, located on a peninsula just north of the Hillsboro Inlet as an ideal spot for the school’s winter term. In 1923, he moved the school’s student body from Coconut Grove to this new winter site. Part of Malcolm’s reason for choosing this particular school campus was that it was fronted by 1000 feet of a wide ocean beach. Malcolm was aware that beaches tend to build up north of inlets. Because of his insight, the beach has over the years escaped serious erosion, remaining for the most part in its same excellent condition for more than 90 years. At the beginning, there were no roads or bridges leading to the school. The campus was surrounded by lush woods and an isolated beach that had to be reached by boat. Because of its isolation, there were no places for visiting parents to stay. The school had to provide campus accommodations for them. The remoteness of the school’s location and its quiet privacy quickly drew the visiting parents into close relationships. Their visits to the school became more frequent and prolonged. Malcolm recognized this, and in 1925 when The Lake Placid School abandoned its practice of conducting its winter semesters in Florida and moved back to Lake Placid (where it is now called the Northwood School), he decided to use the property as an exclusive family winter resort. He invited these parents and a small number of their friends to come to his resort, and they came enthusiastically. Their numbers and their group attachment grew as time passed. The families enlarged and the Lake Placid graduates returned to Malcolm’s resort to renew past ties with one another, bringing their wives and children. Bert Malcolm’s fondness for young people and his insistence that children were always welcome at his resort established a principle that is still followed today. He provided special programs and sports to entertain the youngsters, and this effort has continued since that early time. During school holidays young people have always been very much in evidence at Hillsboro, and family reunions of three or four generations have been common. The non-profit Hillsboro Club was a consistent success through the Depression years of the 1930’s, the war years of the 1940’s, and on into the 1950’s. Family relationships and intimate friendships were the strength of the Club and the basis of its financial success. This was supported by Malcolm’s attention to detail in operating the facilities, his emphasis on excellence, and his outstanding talent for attracting capable, cheerful and hardworking staff. The Club’s buildings became old and in need of repair, but the personal attachments between the Club’s membership and the skillful operation of the facilities by Malcolm more than made up for the lack of the Club’s modernization and comfort. In 1959, Malcolm’s health began to fail. In an estate-planning move, he agreed to sell the Hillsboro Club property after his death to a group of Florida developers. When Malcolm died later that year, the developers purchased the property. The new owners immediately announced plans to expand the physical facilities located on the purchased property, but in doing so promised cooperation with the surviving Hillsboro Club to allow it to continue. The developers promptly began their new construction. In the first year they built the North House and the Tee House, and the next year the Terrace Lounge, the pool, and the pitch-n- putt golf course. 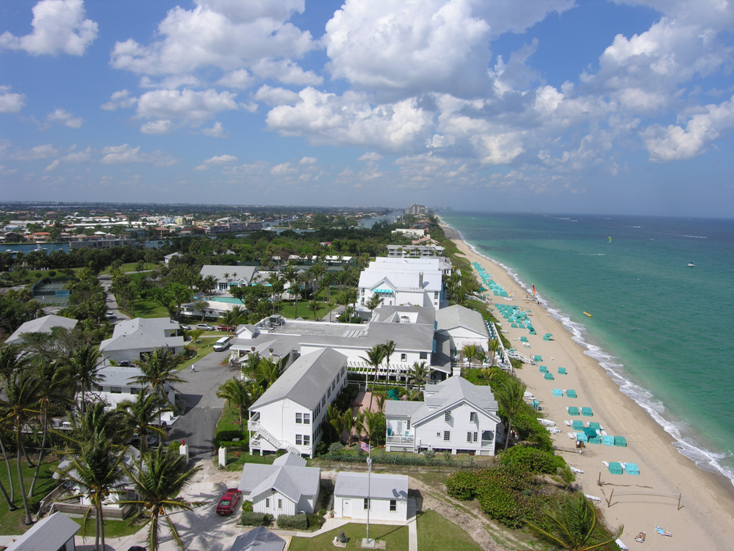 However, their business plans for an even more extensive development of the property were frustrated by a cyclical downturn in the Florida real estate market and a national credit tightening. The developers found they were unable to obtain sufficient financing to complete the building projects required to make their enterprise successful, and consequently, they faced possible bankruptcy. The Hillsboro Club Members recognized that without some kind of intervention, their distinctive community of family and friends would be lost. If the developers could weather their financial crisis, they would complete their buildings for commercial gain and market them to the public. This would obviously put an end to the Hillsboro Club. On the other hand, if the needed financing for the finishing of the developers’ business plan was not forthcoming, there would be a foreclosure by their creditors who would then sell the entire property to the highest bidder. Energized by these unappealing alternatives, several of the Hillsboro Club Members acted to save the Hillsboro Club. Under the leadership of Percival Brundage, who had been Director of the Bureau of the Budget under President Eisenhower, they reorganized and recapitalized the Club. Fees and dues were increased to improve the Club’s financial base and an innovative plan was made to raise sufficient capital to purchase the property from the developers. A Delaware corporation, named The Hillsboro Association, was organized in 1962 by Mr. Brundage to raise the property’s purchase price. To do so, the new corporation made a private offering of its stock and debentures to the Hillsboro Club membership, and it sought out an interested lender. Many families who had a deep attachment to the Hillsboro Club bought up the entire Hillsboro Association offerings without any expectation of financial gain. With these funds and with borrowing from a major life insurance company secured by the mortgage there was sufficient money to purchase the property. A cash purchase was made with the developers, and the 15-acre property with its 27 buildings came into the possession of the Hillsboro Association. The premises were then leased to the Hillsboro Club for a nominal amount sufficient to meet its mortgage carrying costs. The responsibility for operating and maintaining the property remained with the Hillsboro Association while the Members of the Hillsboro Club continued as a private association. This arrangement lasted for a number of years. However, as time progressed, some became concerned about the unfairness of the situation. The Members who had invested in the private offerings were, in reality, subsidizing the non-investor Members in the operation of the Club. There was also worry that if the stock of the Hillsboro Association were to pass into the hands of non-members, the privacy of the Club membership could be compromised. A plan was therefore developed to have the Hillsboro Club purchase the Hillsboro Association by imposing an assessment on all of its Members. This plan did not receive sufficient support from the Club Members, but in 1984 when other financial arrangements were proposed, membership agreement was reached. The Hillsboro Club then purchased all of the existing Hillsboro Association's securities and the Association was liquidated. Since then, the Hillsboro Club has been operating as a private association of a select membership having the same cultural, ethical and social values that have been the basis of the Club’s membership since its beginning. The Club has continued to be rooted in close friendships, the common interests of its Members and its past traditions. Its membership has grown from the small number of Lake Placid visiting parents to nearly 700 Members today. Yet, the personal attachments of the Club’s Members that were encouraged by Malcolm when the Club began have continued to be the underpinnings of the Club today. Many of the Club’s traditions, such as the Sunday hymn sing, the Hillsboro Prayer, ties and jackets at dinner, all white sports attire for tennis, its Christmas celebrations, and the assignment of personal beach cabanas, continue today. These are some of the distinctly personal aspects of the Hillsboro Club. These personal aspects have always been the important ingredients of the Club, which make its lifestyle a significant component in the lives of its Members. An excellent sports program and sumptuous meals are a part of the lifestyle, but it is the warmth and friendliness of its Members as well as their commitment to family values that are the real meaning of the Hillsboro Club. From the time he acquired the property and established the Hillsboro Club, Mr. Malcolm also managed the resort. In the fifties, he relinquished responsibility for day-to-day management to Norman Pancoast, who served the Club until 1958, when Kenneth Kenyon became the managing director. Mr. Kenyon divided his time between The Waumbek, a resort hotel in New Hampshire, which he owned and managed in the late spring, summer and early fall, and the Hillsboro Club, which he managed in the winter. Much of the Hillsboro staff made similar migrations to and from New England as they had under Mr. Malcolm’s leadership. In 1967, Mr. Kenyon retired. His successor was Norman Sheffield, who remained as manager until his retirement in 1986. Mr. Sheffield was succeeded by Robert Case and upon Mr. Case’s resignation in 1988, returned as interim manager. He served in this capacity until March of 1989, when Daniel R. Dodge became general manager. In the fall of 2013, after 25 years of service, Mr. Dodge retired from the Hillsboro Club. Mr. Dodge leaves a wonderful legacy and dedicated staff. The Hillsboro Club has maintained its unique and multi-generational family appeal through many of the ideas implemented during Mr. Dodge’s tenure, such as the highly popular Summer membership program, Nana's Cottage, the Club's dock, the buildings which are now Malcolm House, Van Dusen House, Herschede House, Lighthouse Cottage, the Spa and Fitness Center and the Montgomery Lounge. These are all part of Mr. Dodge’s commitment and contribution to the Hillsboro Club. In February of 2014, Susan Y. Williams was unanimously voted by the Board of Directors to become the Club's new general manager. Ms. Williams had worked with Mr. Dodge for more than 32 years, first at Gasparilla Inn on the west coast of Florida and then at the Hillsboro Club. During Ms. William’s tenure at Hillsboro, she has managed every department from reservations to housekeeping and has been instrumental in managing operations at the Club. Her attention to detail, organization and great leadership skills have created a pleasing work environment for the staff and a smooth transition in management, which is reflected in the wonderful atmosphere at the Club. Beginning in 1988, the Board of Directors started work on a Master Plan for the renovation, rebuilding, and refurbishing of the Club’s aging structures. Many hours, considerable thought and analysis, and the counsel of competent professionals went into the development of this plan. All aspects of the Club’s operations were thoroughly analyzed (finance services, staffing, memberships, etc.) Out of this major effort came the recommendations that the Malcolm House–much loved by generations of Hillsboro Members–the dining room and kitchen had to be replaced. They had been built in 1923; to renovate was just too costly. The razing of Malcolm House in April 1991 was lamented by many who had nostalgic memories of happy times spent in the spacious lobby, the comfortable library, and the simple bedrooms. In its place two new structures have been built; the magnificent Malcolm House with the same breathtaking view of the ocean from the lobby and 14 attractive modern rooms all with balconies, and the Herschede House. Named in memory of the late Mark Herschede whose generosity helped spark the building program the Herschede House has a lovely library, a well-stocked gift shop, and 32 rooms all similar to those in the Malcolm House. The former Nana’s Cottage, the Club’s children’s activities center, was replaced with a new and improved building in 2000. With its larger arts and crafts area, backyard porch, and newly equipped playground, Nana’s Cottage is sure to enhance the Club’s reputation as a family-friendly getaway. The replacement of the Terrace Lounge and Tennis Shop was completed in December of 2001. The Montgomery Lounge and Fitness Center and Spa houses a lounge, kitchen, private dining room, tennis pro shop, gym, aerobics studio, massage and spa treatment rooms, Jacuzzi, and locker rooms. Along with the expanded pool terrace, this addition provides many new and improved social amenities as well as a fresh look to the campus. The Terrace Lounge was renamed the Montgomery Lounge after John R. Montgomery, III, the Club president at the time and the driving force behind its completion. The most recent construction projects completed in 2006 included a new Grounds Building and Guard House, Maintenance Building and Game Room, and new Lighthouse Cottage. The Lighthouse Cottage was designed by Senior Member and architect Avery Faulkner. These new facilities have greatly improved the comfort and modernization of the Club for years to come. Further, they have added new membership interest in inviting their friends and family to the Club as their guests to enjoy a few days or weeks of the Hillsboro lifestyle. In keeping with the tradition of the Hillsboro Club's "Florida" style and the modernization of various buildings, there has been an ongoing room renovation schedule for all 144 rooms and suites at the Club. All bathrooms and bedrooms in Malcolm, Herschede, Van Dusen and Curtiss have been completely renovated. The rooms and bathrooms in North House, Sea Grape, and South Pavilion are all scheduled to be renovated, as well as the Living Room, Sea Room, and Dining Room. The boardwalk and railing around Van Dusen deck and up past Curtiss House have all been replaced with the newest Trex weatherproof materials which add to the overall beautification of the exterior of the Club. In 2012 and 2013, the Club's dunes were greatly affected by Superstorm Sandy, and then the torrential rains in the summer of 2013 created further erosion, which compromised the dunes in front of Sandspur cottage. It was necessary for the Club to temporarily close Sandspur cottage while the dune was rebuilt during February of 2014. Due to the turtle nesting season which begins in March of each year, the Club was required to complete the dune renourishment prior to March. The remaining foundation of Sandspur, the boardwalk and railing to North House was completed in the summer of 2014. The Hillsboro Club membership peaked in 2006 with 655 Senior Members. During the 2008 recession and in the years following, the Club saw membership drop to 580 as some Members needed to prioritize their financial obligations. Private clubs throughout the US were similarly affected. With the guidance of our two Club Presidents during that time, John Gibbons and Charles Farkas, and manager Dan Dodge, the Club was able to weather the membership downturn and maintain a workable budget without compromising the unique Hillsboro Club experience. The Membership Committee and Board of Directors have worked tirelessly to rebuild membership and the Club is on course to reach our maximum of 700 Senior members. The Hillsboro Club still embodies this sense of family and tradition. Eighty percent of the Members who have been at the Club for more than 10 years are related to other Members. Starting at Thanksgiving, large family groups come together at the Club to enjoy the opening of the season, as well as the traditional feast. The Christmas holiday is full of cheer with traditional Christmas carols, Santa Claus, a reading of “Twas The Night Before Christmas,” holiday boat rides and a full, multi-generational house. A growing percentage of members are family and friends in the Young Member category (age 21-40) and come together over special weeks throughout the season to the Club. The under-forty crowd descends on the Club with kids in tow to relax on the beach by day and unwind with a steel drum band poolside by night. Many of these Young Members have been coming to the Club since they were small children and delight in sharing with their own children this campus and friendships that have meant so much to them. There are tennis, golf, croquet and bridge tournaments for all ages to enjoy. There is Nana’s Cottage and playground for children, and the Mini Member Events for teens and tweens. Many longtime members now spend whole or half seasons at the Club and delight when, during the holidays, they are joined by their children, grandchildren and many friends. Since its beginning, the Hillsboro Club's regular membership has been comprised of families and friends who do not live in Florida. Most live in areas where the winter months are cold and the skies are overcast a good portion of the time and come to their Club when the cold sets in. The Club season, therefore, starts in late fall and closes in early spring. Until the recent past, most of the Club staff has had to seek summer employment elsewhere. Only a few maintenance employees stayed at the Club to repair and tend the empty and vacant buildings and grounds. In 1992 a few local Florida residents approached the Club to ask if a new summer membership category might be adopted. There had been a considerable amount of local interest in using the Club’s facilities during the summer months. The summer membership would be comprised of local families and friends selected on the basis of their congeniality, common interest, and shared values. The program would be a private association. This special membership category would not participate in the Club ownership, and would not be eligible for the “winter” use of the Club. This proposal was considered to have a great deal of merit. A good portion of the Club’s staff would be able to be employed on a yearly basis and the property would not remain completely vacant during the summer months. The local residents had their own houses in the immediate area and would not be expected to stay at the Club except infrequently on weekends and holidays. They would have full use of the sports facilities, but this would not make the facilities less available for the Club’s regular Members since the summer season would end when the Club winter operations began. In 1993 a decision was made to create a “summer” membership category of eligible local residents. This membership was to be highly selective based on their congeniality and interest in maintaining a family atmosphere at the Club. Operating under the guidance of the Club Manager, these Members would be expected to organize themselves to generate the close personal relationships among themselves that has been the characteristic of the Club from its very beginning. The Club, however, was originally and continues to be organized to provide a winter residence for its private and intimate community as an “extension of their home” away from home. With the summer Members’ homes in the Club’s immediate vicinity, the Club would not be a “home away from home” for them, nor would they have established a close personal relationship with the Club’s regular membership. It was decided, therefore, that these two memberships should be separate and distinct. In this way, the Club would be able to uphold its historic policy of a maintaining a membership of close-knit community of family and friends. It would remain a “home away from home” for its regular Members, and would become primarily a summer daytime or weekend family club for those having their homes in the Club’s immediate vicinity.